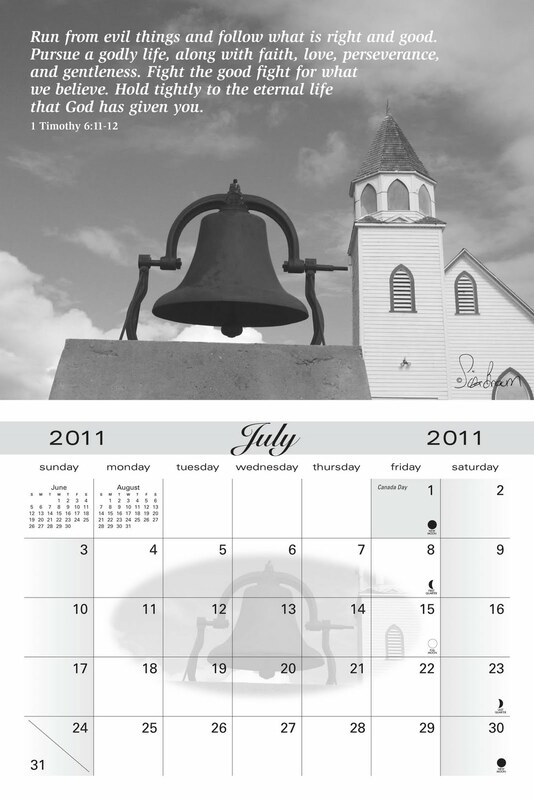 Welcome friends, following are the photographs and stories of the 2011 Inspirational Churches of Saskatchewan Calendar. These calendars are available for sale from now until June 18, 2010. They will be printed in summer and distributed in September/October of 2010. 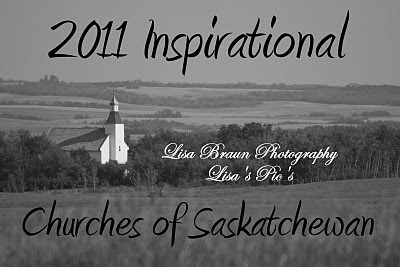 If you'd like to purchase the calendars personally or for your business, you may email me at lisaspics@sasktel.net I hope you enjoy the scenes and the stories. Hope to hear from you soon. One weekend we drove out to Outlook for a basketball tournament with our son. The morning came and we had to leave bright and early and Oh MY! The frost was just so beautiful so of course I had to grab my camera and leave a littler earlier to make a few extra pit stops. 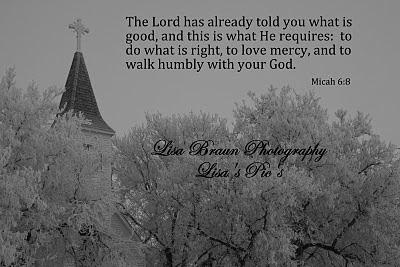 :-) My family didn't even mind this time cause they knew I was praying for a frosty morning so that I could go snap some great church shots.,,,and God answered my prayer. :-) The sun wasn't shining but that was ok..it still makes for such a great photo. We had been out for another basketball tournament with our son and came across this lovely church in the town of Cudworth. One of the great opportunities of living in a small town and having your kids involved in sports, you get to travel to other small towns and communities around SK. 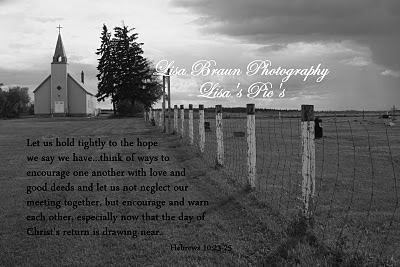 Along with seeing all these great communities, you also have great chances to capture memories and photographs of God's creation. 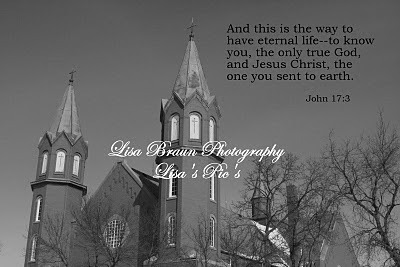 I love taking photos of churches and I love the distinction of all the different church buildings. Oh, and the crosses, they're so beautiful! And each one can be so unique in itself as well. I love the craftmanship of these churches. One day I had to head out to Borden for a photo shoot for the Living Light newspaper. 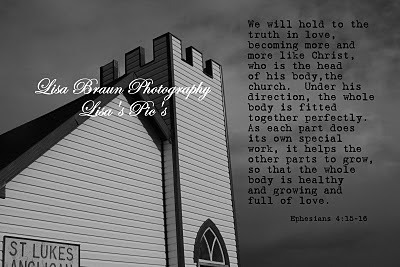 It was a nice day and after the shoot, I drove around town looking for the church. I instantly loved this small church nestled in the trees with the simple cross on top of the steeple and also another cross on the front of the peaked roof. As I was taking photos of the church, I prayed for the families in this town as it wasn't that long ago that a van full of young Borden basketball players were in a fatal accident - they were on their way to play a game against the team that my son plays on and the game was at our school. I had come across the accident right after it happened, I was on my way to the school to pick up my son. My heart just cried out "why her Lord, why this mom & her son and not me & my son?" Oh it was so hard to see and even harder to imagine what this mom was going through. I've never stopped praying for her. We can't always answer the why questions of life and it is not always easy to continue on. 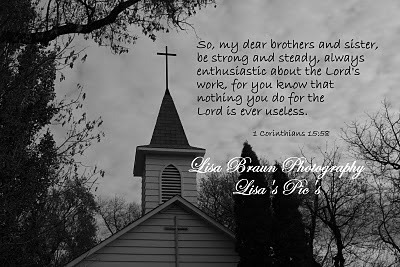 But with the strength of our Lord, we can carry on under the comfort of His Wings. I pray for you, families of Borden, each time I think of you. God be with you. During the summer months, I co-ordinate 5 day Bible clubs for children ages 5-12 and have often driven along with the youth workers who drive around SK to teach these 1 week clubs to kids. It's fun to see the kids hearing the Bible stories, sometimes for the first time, and singing the songs, repeating the memory verses, handing in their lessons and playing the games. These youth workers devote their entire summer to traveling around our great province to teach these kids clubs in communities all over SK. This particular week, we drove to the Muskeg Lake First Nation to share with the kids there. Across the road from where the club was, there was a gorgeous lake behind this quaint little church located next to a graveyard. What an incredible setting! I just couldn't resist heading over the road and snapping a few shots. It was a perfect country setting. 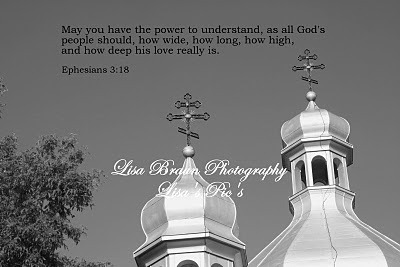 After dropping our girls off at camp, we drove through parts of PA. We saw the crosses of this church rising over the tops of the trees and just had to come on over and take some photos. I love the differences of all these churches. Each one is so unique and has a character all it's own. On this same day, we had just dropped our son off as well - he had just left to go on a Missions Trip with other youth across the city - they were off to Trinidad. My hubby and I were looking forward to a week alone together. 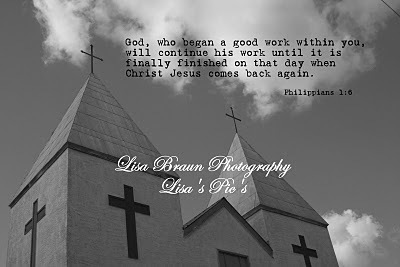 Little did we know that God had different plans for us that week which included burying my father after his 77 years of life. It was a difficult week and even more difficult telling the kids that their grampa passed away. I'm thankful for some good memories with my dad...some are difficult memories as well, but God is good and I am thankful for forgiveness and restitution of relationships. I spent many years going to church as a child and even though I didn't always understand everything or appreciate the guidelines in our home and in the church, I can understand better now. God has helped me to see my father in a different light and the last couple of years of his life, our relationship was much better than it had ever been. I am very thankful for that. My father instilled in me the importance of taking your family to have fellowship in church each week and to grow in the knowledge of the Bible. On the same day that I was driving around SK with a youth worker who was teaching the 5 day kids clubs in communities around SK, we also drove through the Mistawasis Reserve as well. It wasn't far at all from the Muskeg Reserve. When I saw the white of the church poking through the fields, :-) I just had to drive down that summer road and check out this little beauty. 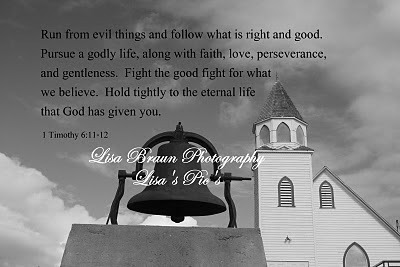 I was so pleased to see the bell standing atop a cement pillar in front of the church, which obviously used to sit up in the steeple. I loved the location of this building as well, nestled in the trees beside a graveyard down a narrow summer road. These are the best places out in the country. There's the cutest little church - St. Luke's Anglican Church just north of Mont Nebo as you're driving towards Sandy Lake Reserve. It's really small and down a narrow summer road as well. Some of the tombstones behind these small country churches have dates from the 1800's on them. 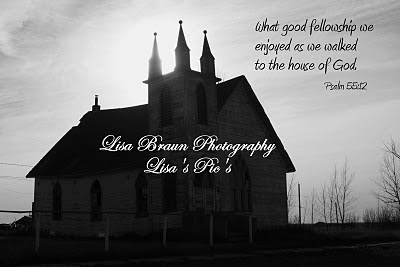 Can you just imagine the stories that these people who attended these quaint country churches have to share with us? Oh, how I'd love to hear some of those stories. Ah, one of my favorite places to be. How I love to walk in the doors and see the smiles and receive the handshakes and hugs of so many of my extended family members. "How I love to part of the family of God...." another song my mother loved to sing back in the day. 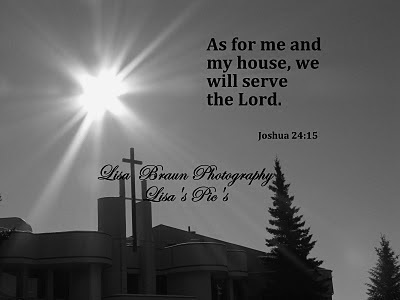 :-) This is truly my home away from home...a place to rest, to laugh, to cry, to pray, to celebrate, to use my gifts...and to praise my Lord, the God of my life, my Savior and my King.....along with my other brothers and sisters in the Lord. On the particular day that I took this photo, the sun was shining, obviously, :-) and there was not a cloud in the sky...and it was a cold crisp morning. I loved the suns rays shining over the cross of my home away from home. We were out for a basketball tournament out in Outlook this weekend and between games, I took the girls and went for a little drive through the town...had to fill up with gas anyway. 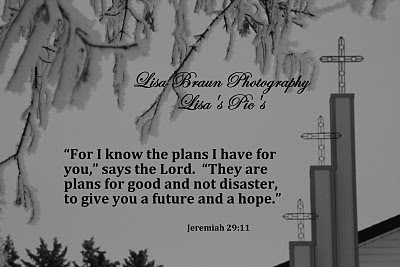 :-) Yep, I had my camera along and I was scoping the treetops for the church steeples I so longed to find. Low and behold, here was another one that I had not yet gotten a photo of. The frost on the trees across the street from this church gave a beautiful frame for these 3 crosses. Reminds me of the 3 crosses that stood on Golgotha so many years ago where my Jesus hung on the cross with 2 other men on their crosses on either side of him. To the one man he said, "Today you shall be with me in Paradise." Why? Because the man believed that Jesus was the Son of God. Just a couple months ago, I stood on the base of that hill where those 3 crosses once stood along the Damascus Road heading into Jerusalem. I walked the streets in the Old City where Jesus carried His cross on the way to his crucifixion. I saw the empty tomb in the Garden where He no longer lay because He rose again to live in Heaven with His Father preparing a home for us too. Are you ready my friend? Oh how wonderful it will be one day, when with our Savior we will forever be...where there will be no more tears, no more pain, no more hurt....only joy and peace and love. Thanks for journeying through these memories with me. 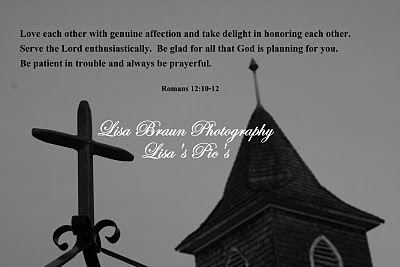 I pray that you are blessed through these photos, stories and the calendars. God bless you all! Those are all excellent, Lisa! That is a superb calender.